BobbyGlam Announce Their Top Five Hair Tools. BobbyGlam hair extensions reveal their favourite hair tools for ultimate styling. BobbyGlam announce their top five hair tools to achieve salon styling at home after looking at hair straighteners, hair dryers, and curling tools from some of the top brands. The GHD IV Styler is the first pick of the top five hair tools for BobbyGlam. The famous GHD flat iron can be used to style the hair super straight, or into flicks or waves. It can also be used to easily curl the hair. Next, BobbyGlam select TheO Pod from Cloud Nine as one of their favourite hair tools. TheO Pod is designed for use with different sized rollers to create varying looks. TheO Pod heats up rollers in less than 4 seconds, giving heat on demand for styling. BobbyGlam return to GHD for their next product: GHD Air. The GHD Air hair dryer offers professional strength hair drying and advanced ionic technology so clients can achieve salon styling at home. GHD Air comes with variable temperatures and power controls, as well as two concentrator nozzles, and a cool shot function for ultimate styling. BobbyGlam select the Babyliss Pro Conical Wand as another of their top hair tools. The Babyliss Pro Conical wand can be used for styling curls and waves easily at home. This wand comes with 25 variable heat settings for total styling flexibility. 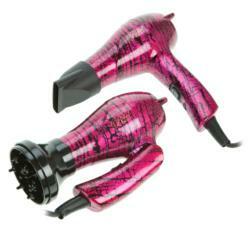 Finally, BobbyGlam select the Diva Pro Rebel Mini Hair Dryer as the last of their top hair tools. This hair dryer is the perfect travel companion, but still has a strong airflow, as well as two heat and speed settings, so styling certainly isn’t compromised. It comes with dual voltage and a BS/ European plug adaptor; it’s available from BobbyGlam in the pink Fractured Edition or as the Steel Zebra Edition. These top five hair tools are available from the BobbyGlam website alongside hair extensions, hair care products, hair accessories, and vintage jewellery.